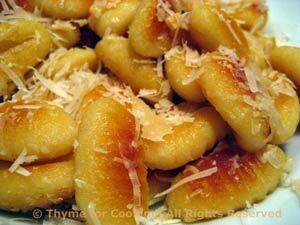 Thyme for Cooking Menus: Veal Marsala with Fried Gnocchi, easy recipes. The veal cooks very quickly. 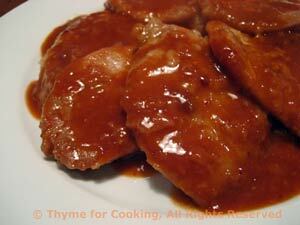 You can either keep it warm in the oven or add it back to the sauce to re-warm if you prefer to have it less well-done. This is quickly done and best if done at the last minute. A sprinkling of lemon juice and sea salt is all that's needed to let the spinach shine. The leaves should be barely wilted. 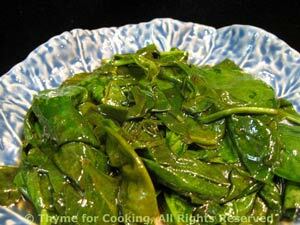 Cut big spinach leaves into strips. Snip chives if using fresh. Heat 1 tsp oil over medium high heat in large nonstick skillet. Add spinach and herbs. Quickly stir-fry, 1 or 2 minutes. The spinach should just start to wilt.